If the elder Park is Batman then Chu-young is certainly the boy wonder and plans to follow the trail blazed by the United man, repeatedly stating his desire to play in England . With the meteoric rise of the player, who turned 20 on July 10, few would bet against the sensation doing just that. To anyone living in north-east Asia , it is scarcely believable that the Daegu native was unknown just a year ago. The striker's six goals during last November's Asian Youth Championship, won the title for his team and the prize of MVP for himself. 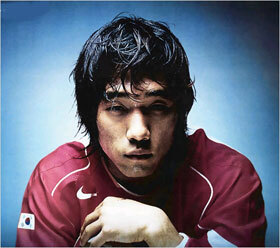 The greater award of the AFC's Young Asian Player of 2004 title was received in January 2005 as was attention from a host of K-League clubs with FC Seoul eventually capturing the services of the emerging celebrity. Encouragingly for Park and for South Korea, he seems to be able to make the step up to the next level with breathtaking effortlessness. He finished the pre-season Hauzen Cup competition as joint top scorer and then went one better by becoming the outright leading marksman in the first stage of the K-League, despite missing five games due to international duty. His mere presence tempts the sometimes reluctant Korean public to pour into stadiums all over the republic. If observers didn't believe the hype, they had to reconsider in June. After only three appearances in the K-League, national coach Jo Bonfrere bowed to media pressure and included the deeply- religious goalgetter in the starting line-ups for the vital World Cup Qualifiers in Uzbekistan and Kuwait . A last minute equalizer in Tashkent kept his country on the road to Germany 2006 and five days later, the striker scored the first goal in a sweltering Kuwait City and earned the penalty for the second to secure the win that guaranteed South Korea a place in a seventh World Cup. Rarely has a rise been so dramatic but the ambitious and single-minded 20-year-old doesn't plan to stop anytime in the near future as his avowed intent is to move to England as soon as possible. South Korea just may have a pair of global stars on its hands.